The annual Get Prepared, California! Auction is now open until April 30th! The auction raises funds to help support the American Red Cross disaster preparedness efforts in California. 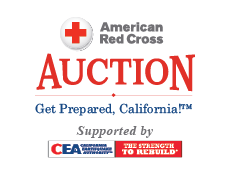 Thanks to the generous support of bidders and the efforts of California Earthquake Authority (CEA) and iHeartMedia, the 2018 auction raised $175,978. The funds raised to date by the annual auction now exceed $1.2 million dollars. Help us make this year’s auction a great success. Bid on once-in-a-lifetime items and incredible experiences, below, in our star-studded auction!